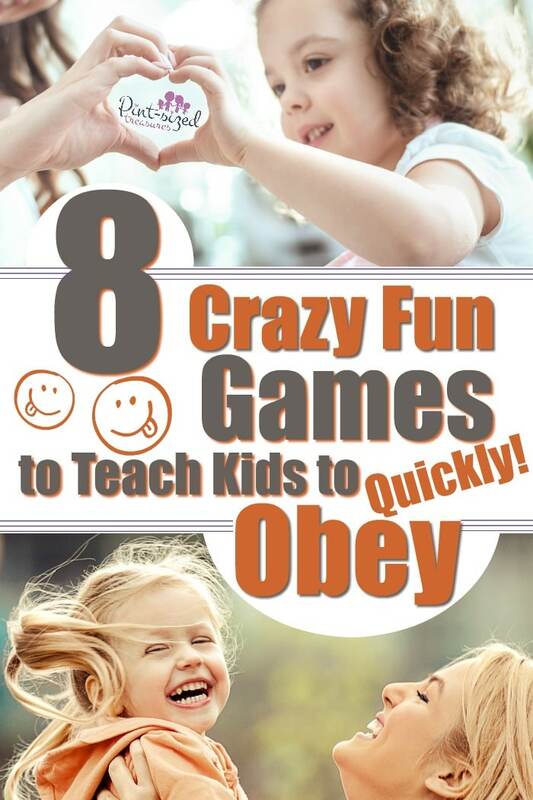 I love using games to teach important lessons to my kids — and teaching kids to obey quickly is no exception! Be sure to check out our HUGE list of Fun Family Games to Play for even more ideas! We’re always playing impromptu games! And even outdoor games for lots of families! Even those games are fun, they’re also awesome teaching tools. And when it comes to obedience, we need every creative opportunity possible! Kids obeying their parents, teachers and mentors is quickly becoming a part of the past. But is this truly preparing our kids for their future? Obedience is something that’s required in adulthood. Why should we be painting an unrealistic world for our kids? I want my kids to leave our home, spread their wings and soar with confidence that they’re prepared for real life. One way I’m preparing them for that future is by teaching them to obey. It’s not only to prepare them for the real world, but also to keep them safe now…and even in their future! But if you’ve emphasized quick obedience in your home, your children should naturally know that they need to follow your instructions. But often times it is. Obedience is a beautiful thing when there are people in your life guiding you. They’re watching over you and trying to make your life’s journey as smooth and incredible as ever. Loving, involved and intentional parents won’t use teaching obedience as an opportunity to “boss” their kids around about every minute detail. In fact, obedience may not even be the top three character traits their teaching their kids. But they do teach it. Because obedience absolutely necessary to create a well-rounded, respectful child who grows into a responsible, caring and faithful adult. Kids that learn obedience at home also how obedience at school and church. If they’re not taught to obey at home it shows up at school. 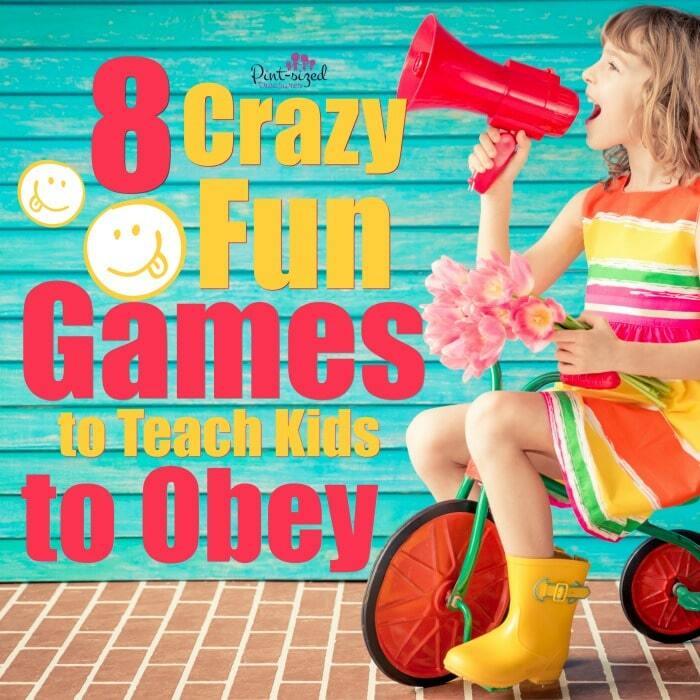 Teaching obedience doesn’t have to be boring and stressful. (But in the toddler years it’s definitely repetitive and exhausting! If you’re a toddler mom, don’t give up! Your toddler will eventually learn to obey your instructions and you will find that a cranky toddler can transform into a happy and content toddler! Don’t quit! <3) Let’s make learning to obey a little bit more fun this week! You can use any or all of these games as an opportunity to teach your child why it’s so important to obey. But, you’re also showing your child that obedience isn’t always about following rules…it’s also about living within the healthy realm of safety and security that’s guarded by parents who love them! Ready to play some games? Red Light, Green light. This is a classic game that’s still creating giggles! Players all line up at a starting point. The goal is to be the first onto reach the end point — or finish line. When the leader says “Green!” every player runs. As soon as the leader yells “red” every player has to stop…immediately. If anyone moves, they are OUT and cannot continue the race. We even yell “yellow” to change things up for a super slow walk. Toddlers to Teens love this game! Silverware game. Super easy game to play at the dinner table. At any time during dinner, have a parent say, “Raise your fork!” First person who raises their fork wins! Another option is to say, “All forks down!” First person to put their fork down wins! Stand up for dinner! Another family meal game that’s super simple. Let your kids know before dinner that there maybe an obedience game during the meal. When a parent says “Stand up!” the person to stand up wins! Simon Says. We switch this classic to “mommy says” or “daddy says” and it works perfectly! Laundry Toss. Pair up your family’s socks and hand out the socks to your kids. Line up laundry baskets and tell kids to throw specific colored socks into each basket. But this is only fun if you keep this fast paced! Change things p fast. Yell, “Black socks!” and they toss as many black socks. Then, “Green socks!” and they switch and try to grab and toss as many green socks as possible. Prepare for giggles! Follow the leader. Such a powerful teaching game! How does this teach kids ot obey? It teaches them to copy whatever the leader is doing. IF the leader claps, they clap. If the leader hops, they hop! A classic game that teaches how important it is for everyone to follow the leaders in their life! Guess the leader. We love to play this at parties, church fellowships and even on preschool play dates! Choose a person to leave the room and tell all other players to sit in a circle. Quietly choose one “leader” and have that person begin snapping, clapping, winking or any simple motion so that everyone can copy them. The person who left the room has three tries to guess who the leader is. Whoever is the actual leader show change things p about every 30 seconds to keep things interesting! Draw some grass. Draw a house on top of the grass. Draw a chimney on the left side of the house. Put a door on the front of the house. Draw two windows on the house. Draw someone looking out the window. Draw a dog running in the yard. This is definitely a silly game, but it’s a light-hearted way to teach following instructions! Since we’re chatting about games, I want to warn you about some other games my kids are never allowed to play. They’re dangerous in so many ways! Read about those games here. Obedience is a super important learning adventure in childhood. When our kids see that we’re teaching them obedience out of kindness, love and a desire to see them excel, it’s recieved much more quickly. If you’re struggling with your child’s attitude toward obedience, then maybe consider focusing on winning their heart first. More than any parenting tip I’ll ever give my best friends in life, winning their child’s heart is always, always number one. Without it, teaching obedience, manners, diligence, faithfulness etc. is a lost cause.